I decided to give it a go and managed to work out how this could be done. Admittedly, my first attempt failed, but the second one worked out. Later I found a comprehensive description of the technique written by Peter Budai. He calls this tiling "high density", and also gives instructions for low and middle density. The basic technique for high density tiling is as follows, and is the text I wrote back to the person that asked in the first place. It somewhat summarizes what Peter Budai nicely diagrams. Make a 7 by 7 grid on a square. Make the necessary precreasings for hydrangea on each of the corners, assuming a square consisting of 4/7 by 4/7. Collapse all four hydrangeas at the same time (go through them one by one, making them partially 3D, then collapse - a bit trickier than doing a single one). Work on each hydrangea tile individually, just like you only had one hydrangea on a square. The steps are identical from here on. How do you divide into 7ths? Ah, the document has 3 pages. On the third page, it's shown how to do 7ths. It's very simple :) Divide into 8 and cut one row and column. Paper is clear without "bad" creases. You can use the folding method, but I just find these two easier. 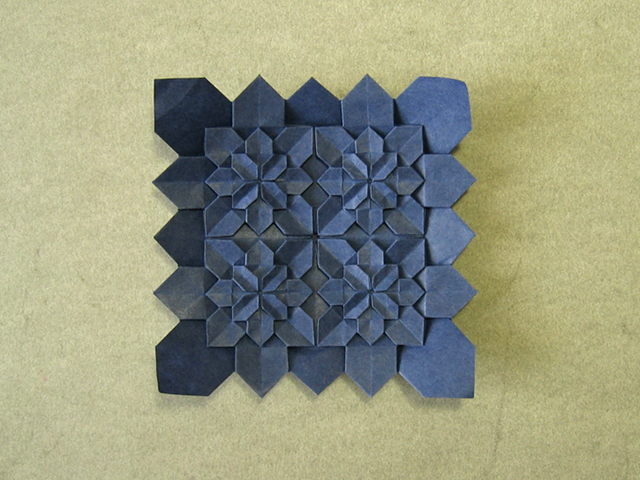 A few weeks ago I was experimenting with 90 degree intersections and cross box pleats and got a result that looked like a level one hydrangea, without the flaps you have to fold under each level. With a little tweaking it now looks like a cross with a lotus-like flower in the center. in the center, did you end up that you could fold another hydrangea too? anyhoo thanks for the instructions! Can You please Make A Video Sara ? Can you please make an instructional video showing how to fold this model ? I really enjoyed folding the original Hydrangea I would absolutely love to make this beautiful work of art ! Funnily enough, I figured out how to make this pattern before I found these diagrams. They make life much easier (as in you don't have to think as much - although I often find that's the fun bit). Sara, I can't access the link. Fix it! I've contacted Alex to make him aware of it. The link is generally correct, but it seems there's a problem with the database that Alex is using. I have just folded a high density Hydrangea, but I added a fifth flower in the middle. You just need to squash the central square behind the model as usual and then go on. If you're familiar enough with the model, it will fold almost by itself. I've tried the 2x2 high density with a center flower, it's working pretty well. I've not created the first flower stage.